Follow the link to the library's website for events, and online resources such as audiobooks and catalogues. Follow the Lee County Public Library on Facebook! Because of the need for pubic Internet access the Library now has 12 computer stations, each with a 2 hour limit per day. The Library serves as one of three downtown hotspots for wireless internet. Bring your smartphone, laptop, or iPad and surf the web. The Lee County Public Library has over 20,000 books to choose from. There are also audiobooks, magazines, VHS, and DVD's available for checkout. Get your library card for Free and begin you public library experience. Check out any book for up to two weeks, but be sure to return them for others to use. Check out movies for 3 days. After three days there is a $2 late fee. The library is always looking for donations. If you have books or movies that you would like to donate please let us know. If we cannot use a specific item on the shelf then we will first offer it back to you and then place the item for sell. Proceeds from sales go toward youth programs. For four weeks in June, the library has a summer reading program. In this four week program there are special speakers and activates for children of all ages. Each year there are different speakers so follow us for more events and announcements. 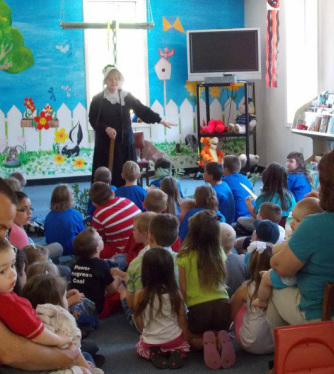 During the school year, the library has a story hour for children pre-school age every Tuesday at 11:00am. Every week there is a storyteller reading book, a craft activity, and snack time! The library runs this program with the school calendar so if there is a snow day and school is closed then the Story Hour will be canceled also. Do you want to learn more about your family name and the history of Beattyville/Lee County? The Lee County Public Library has genealogy documentation given to them by the Historical Society. They are working with the Lee County PVA office to document and map all the cemetery's in the county. Many cemetery's have changed names from the 1930s to today. The public is encouraged to submit their own genealogy records for historical preservation.